I’m such a fan of pasta dishes. 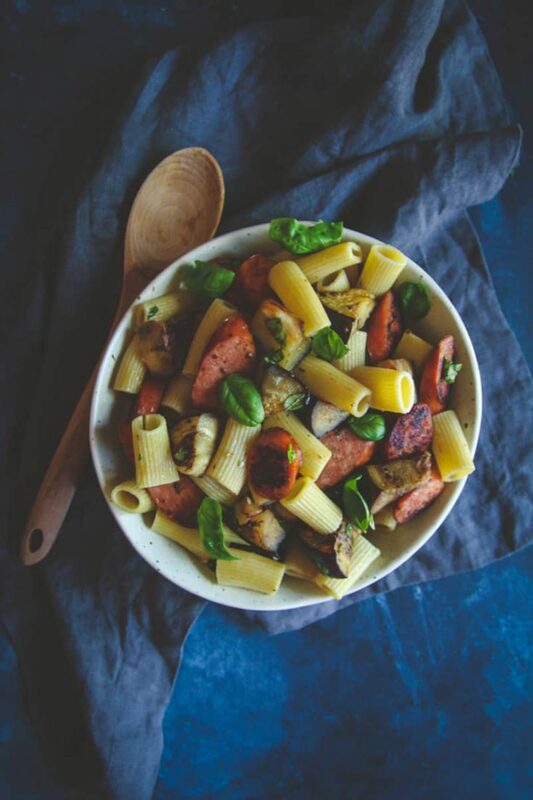 Especially ones like this 5 ingredient rigatoni with eggplant and chorizo that tastes like summer in a bowl and is made in under 30 minutes. 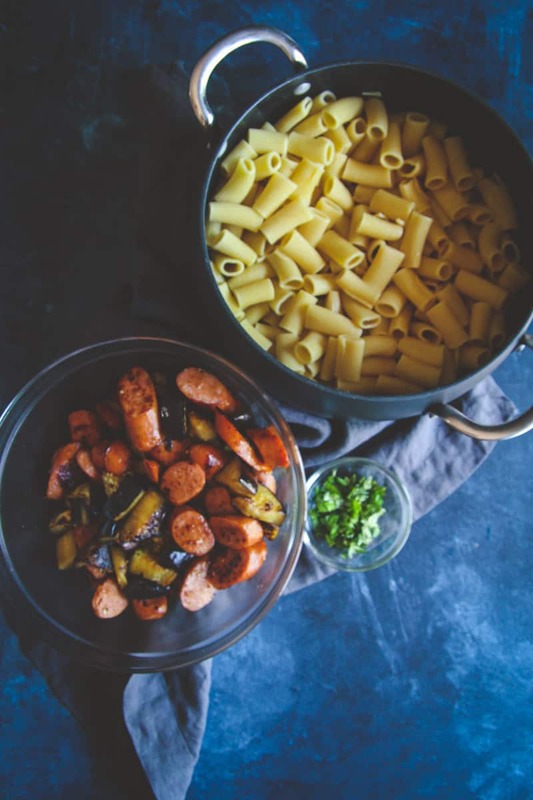 Pasta dishes are great for when you need to get dinner on the table, quickly. 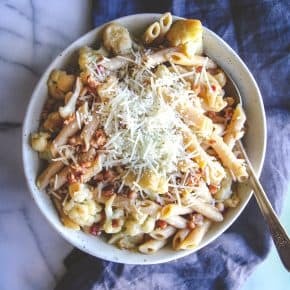 I have never needed quick meals like I have this week, so this week’s Five Ingredient Friday recipe was especially needed and useful. 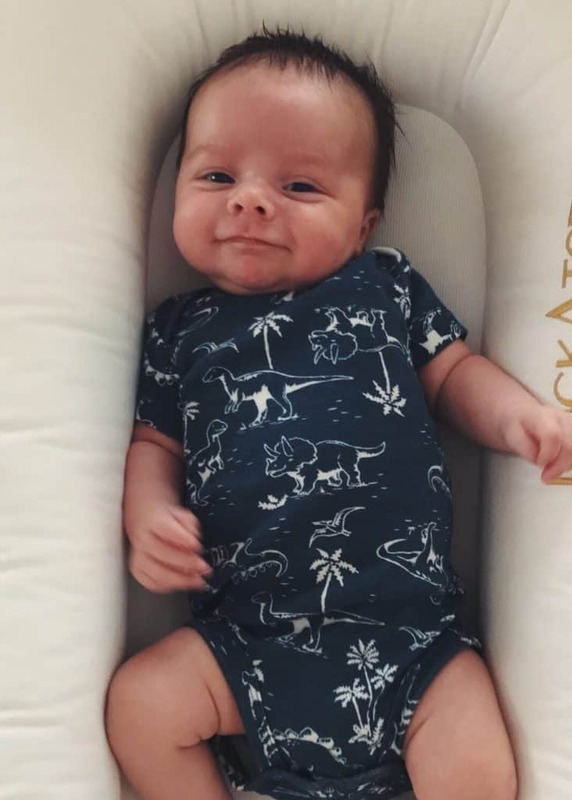 Summer is so hard, baby Ben is happily at being watched in home and by grandma, and will soon start up at daycare again. For those of you who don’t know, I have a full time job I enjoy very much, outside of this blog. I spend my days helping run a small natural products company called True Botanica (I use so many of our products: this lip balm is a favorite and all my friends are obsessed with it too, I take our multivitamins everyday, and our elderberry thyme syrup is a staple in my house all cold-season long!) I should really do a post on how I spend my days sometime, because I know many of you ask how I manage working full time, blogging, and having a family. Very carefully and very scheduled out is the short answer lol. Ok, so back to the recipe! 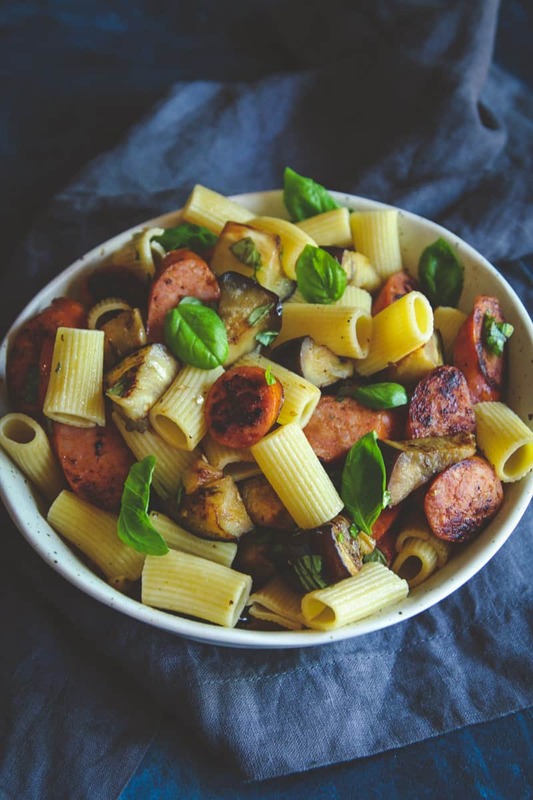 This one is a super simple 5 ingredient recipe that uses rigatoni pasta (you could use any type of pasta you’d like) and pairs it with eggplant and chorizo (which has a nice bite to it) and then is topped with fresh basil. So yummy and easy to make. The first time I made this dish I stood over the stove when the dish was done and was just eating forkful after forkful, right out of the pot lol. 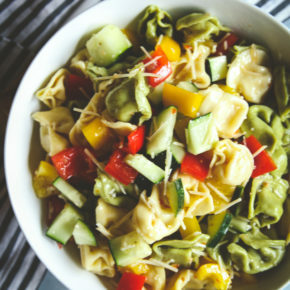 If you’re looking for another great pasta recipe, this 5 ingredient healthy pasta has been getting really great feedback from readers! How was your week? I hope you all have a wonderful weekend. Cook rigatoni according to package instructions, strain and set aside. Meanwhile, cut the eggplant into chunks (remember that eggplant cooks down in size so the chunks can be on the bigger size). In a large nonstick pan (you can do this in 2 batches) heat 1 tablespoon of the olive oil over high heat for 30 seconds, then add in 1/2 the amount of eggplant and 1/2 a teaspoon salt. Cook, stirring frequently for 3 minutes or until the eggplant is cooked down and slightly brown. Set aside in a bowl, and then repeat with the remaining eggplant. Cut the chorizo diagonally into pieces. When the eggplant is done cooking remove from pan and transfer into a bowl, add the cut the chorizo to the pan you just used and cook for 2-5 minutes on high to warm it and brown the outsides. 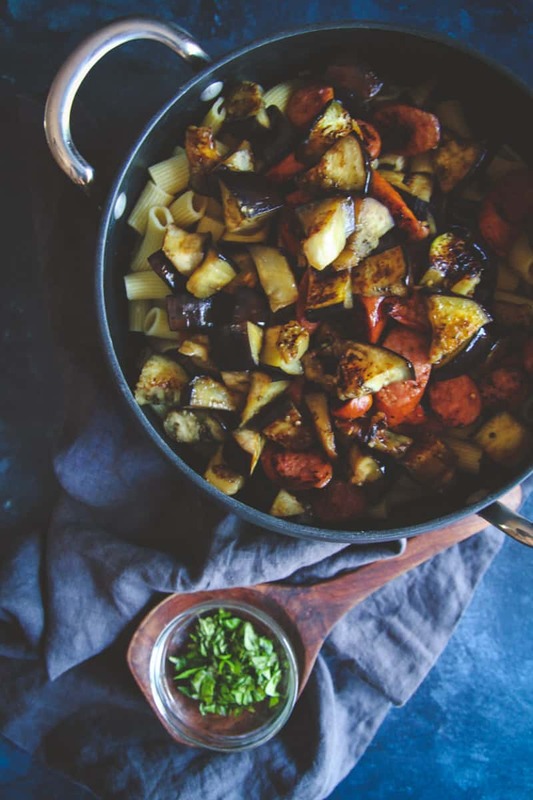 Transfer drained pasta, eggplant, and chorizo into a large bowl and stir. Transfer to bowls and top with fresh chopped basil. 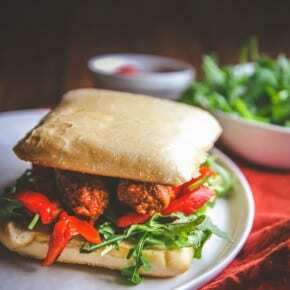 hey girl- this looks so yummy! Ben is so cute and getting so big already! Y’all have a great weekend! Thank you so much girl! I cannot believe how much Ben is growing! Recipe looks delicious! But the absolute best is the photo of your sweet baby! Congrats! LOVED this! You can also use leftover cooked eggplant (like from caponata), you can use kielbasa or Greek loukaniko…the possibilities are endless. Excellent idea Phi! Next week we have a huge monthly farmers market in our area so we’ll be trying this out with homemade fresh sausages and eggplants from Panos’ parents garden. Can’t wait for this! :) M-m-mm!